I am nearing the final stages of building my house. Overall the experiences has been really good and very educating. Building it “on the side”, through the winter, obviously has its share of challenges. As the saying goes, what doesn’t kill you makes you stronger. A few times I wasn’t sure which of those it would be, but at the moment it is looking like “stronger” will win out. Through the process I of course had the opportunity to work with a number of different subs, each with their own style. If I can share one piece of advice for anyone who decides to do this process and handle the GC end of things….it is to pick subs that A), you are the most comfortable with, and B), pick sub-contractors that work with each other and/or speak highly of each other. It pays off in the long run. These guys made it easy. The purpose of this email however is not to guide you through the home-building process. It is to share a story about one sub in particular who goes the extra mile and truly cares about the work he is doing. He has similar DNA as to what we strive to have at Drexel. It all comes down to CARING. The sub-contractor in this case is Don Schmidt Plumbing. Don is doing the Septic and the plumbing. I had gotten two plumbing bids, and Don was not the cheapest one. However I felt good about what he had to say, and he is a customer of ours. It turned out to be a great decision because he has added a ton of value from the first day. Not even on things completely related to plumbing. From the ideas that came up, to the quality of his work, and the condition he left things in when he left, I couldn’t be more pleased. You can tell when someone cares vs. when they are just there to do their job. I had another sub, who will remain un-named, who you could tell was there to just get the job done and not much more. That sub over-promised about when they would show up and then when they showed up they were sloppy, knocked things over (without picking them up), left their marks. They left the jobsite having accomplished what they needed to, and a different vision of excellence. I will pay that invoice with a little bit of a discomfort. I will write the check to Donny with a smile on my face. –Value Added Suggestions. Donny seems to go through every project as if it were his own. Giving ideas and tips for products or practices that will bring value down the road. And these things are not more money in his pocket. He does it simply for your best interest. IE: We had planned on putting an iron filter in, and he explained why we wouldn’t need to do that after reviewing the water tests. Less $$ for him…but the right thing to do. Treat each customer with this level of care. Early on he suggested that I bury all the downspouts before they backfill. I wasn’t going to bother with that until the end, but this saved me a ton of time and sweat. Him and the excavator did it significantly better than I ever would have. -Clean. Leave everything you touch in better condition than it was before it was in your possession. I often could not even tell if Don was there because he didn’t leave a trace of a mess. And anyone who knows me, knows how much I appreciate this. Apply this principle to every aspect of life please. -Lunch. On Friday I had the day off and was working out there with Don and Mark Schairer’s crew installing the septic tank. Donny had his wife bring lunch for all 8 of us. And he picked up the tab. And you could tell he was genuinely proud to do so. It brought smiles and good conversation over the lunch break. This stuff goes a long way. Don’t pass up the opportunity do this type of thing for your customers. –His Wife. Donny regularly works with his wife Gwen. She runs back and forth to the truck loading & unloading material and is there to help him out. When I stopped by one day during lunch, they were both sitting on the front porch eating lunch together. You never hear them argue, they have truly developed a relationship of compromise and support for each other that I have a lot of respect for. Love, Serve, Care–> It all starts at the home front. Take the time to respect and practice compromise with your other half, because without those two things you just a fool. –The Rug. This actually speaks for itself, and believe it or not was the trigger for this email. See below picture. One seemingly insignificant example that sum’s up Don’s level of care for his work. 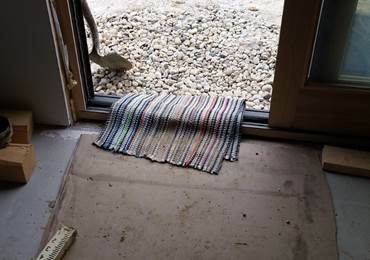 As they were installing the septic, I noticed Don had pulled a rug out of his truck and covered the patio door to protect it. Average people don’t do that stuff. I know I never would have thought of it. That right there is preparation and foresight. He always has the right tools to get the job done, and is highly organized. I will leave it at that. Every now and then I feel the need make the attempt to try to be a little bit insightful, and I think I was waiting for the moment during this project….what have I learned that I can share? If nothing, then was it really worth it? This was the strongest message I felt I wanted share with my friends. We talk about supplying happiness, well this is proof that others are out there doing the same, and what it looks like. On a lighter note, since I listen to the radio on the jobsite constantly, I hear this commercial frequently and I guess a similar message applies. Are you just doing it…or doing it well? John Deere, Not how fast you mow my friend it’s how fast you mow well.